Looking back through Messenger newspaper for this time in 1969, one may have expected to come across some stories about the Moon Landing, but it appears that the brand new St Agnes Shopping Centre was the highlight for our area! Featuring a special 40 page lift-out advertising Adelaide’s Newest Fully Air Conditioned Shopping Centre. 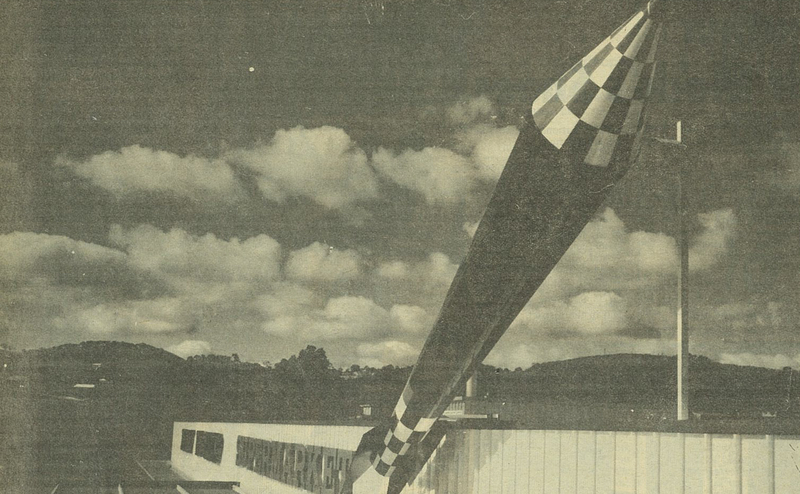 The Centre was described as a New concept in local shopping housing a large Coles New World supermarket, post office, newsagent, dentist, doctor’s office, Commonwealth Bank, men’s hair dresser and 25 specialty shops and the exterior was complete with a special ‘rocket’ motif that represented the progress of the 1960s. Now, 45 years later the St Agnes Shopping Centre is about to undergo a major renovation. It is interesting to note that Coles, the post office, Commonwealth Bank, newsagent, hairdresser, and even the ‘buff coloured terrazzo floor’ are still there. Alas, the rocket has long gone. The Local Hisotry Service has a copy of every Leader Messenger released, look out for future past stories to surface in Off The Shelf.